The plot of Is He Dead? centers around a painter in need of some fast cash who realizes his artworks would fetch a higher price if he was deceased. His acquaintances proceed to force him into a scheme where he fakes in own death and is forced to inhabit a false identity while the real him remains trapped in a dark, confined room so that those around him can profit off of his creative talents for the sake of a secretly-evil art dealer. It’s pretty much the same plot as Get Out, only it’s set in 19th century France and doesn’t end with people being violently murdered. 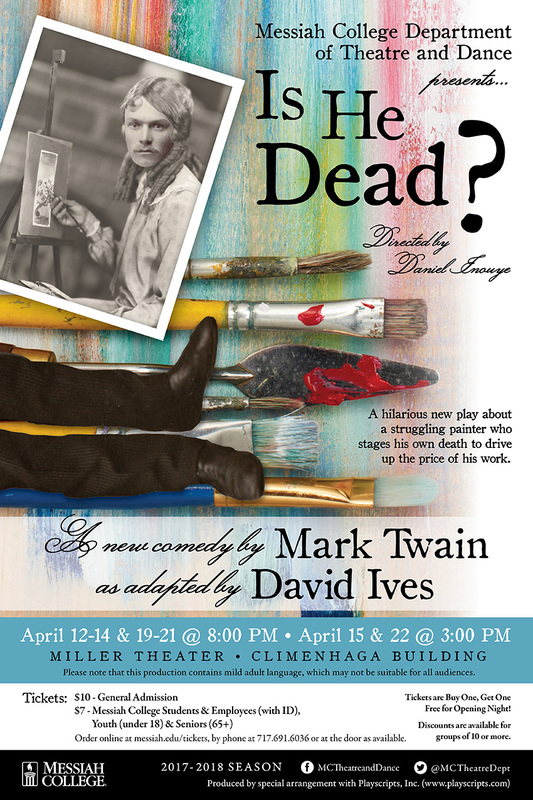 The standout in this production of Is He Dead? is undeniably Craig Terrell Jr, ’18, who portrays the struggling artist Millet. Following his ‘death’, the painter dresses up as his nonexistent sister in an attempt to fool those around him into thinking he’s another person. Because of this, Terrell is forced to play two characters at the same time, and brings a lot to the performance; in both delivery of dialogue and physical comedy, he excels at getting laughs from simple motions and gestures that are delivered with an excellent understanding of how to take these simple directions and turn them into effective humor. Balancing both of these characters while also delivering a strong comedic performance is massively impressive, and elevates the source material to something that can still manage to feel timely and entertaining. Props to the rest of the cast as well, who are forced to carry a solid chunk of the runtime without Millet, yet manage to consistently keep things fresh. Adapting a Mark Twain piece into a play in 2018 while remaining fresh and entertaining could certainly prove challenging. Luckily, much of the humor here is timeless and doesn’t feel as dry and stuffy as many old English plays can when adapted for the stage. Once the main plot gets going, and Millet takes on his alter ego, is where things really start to pick up. We understand everyone’s motivations of why they need this money and how they’re going to get it, but it definitely takes a decent amount of time to get there. When things start to wrap up in the third act is where Twain pulls out all the stops; blending dark humor, unwanted marriage proposals, dancing on a coffin filled with rotten cheese, and the start of a polygamous relationship into about fifteen minutes. Multiple times throughout this third act, a side character would turn and directly break the fourth wall to address the audience on what was happening (or perhaps give us a glimpse into their internal monologue) which felt odd, as it essentially puts the brakes on the story (even if just for a few lines) to tell us things that we can pretty clearly understand just from watching these events happen organically. Is He Dead? is funny, well-acted, and certainly worth your $7. Terrell is the standout who elevates the source material with fantastic comedic delivery, and the rest of the crew blends together with great chemistry to keep things feeling fresh and consistent. Despite being written centuries ago, Is He Dead? manages to serve as an entertaining and surprisingly different theatrical experience. Is He Dead? runs April 14 and 19-21 at 8 p.m. and April 15 and 22 at 3 p.m in Miller Theatre.